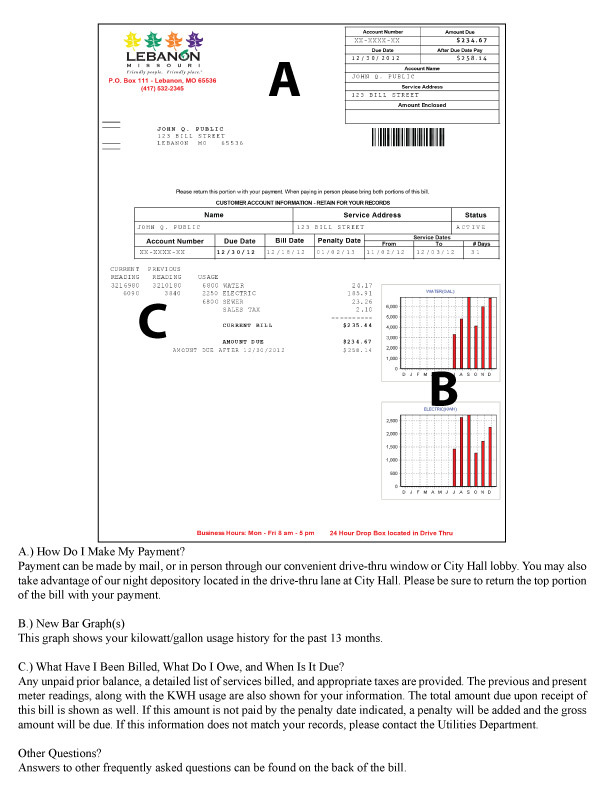 Starting on 01/29/2013 utility customers will see a change in the way their bill looks. The City of Lebanon is now printing utility bills on 8.5x11 sheets of paper instead of the old postcard style bills. The sample below is what your new bill will look like, and it has explanations about the information provided in the new bill. A.) How Do I Make My Payment? Payment can be made by mail, or in person through our convenient drive-thru window or City Hall lobby. You may also take advantage of our night depository located in the drive-thru lane at City Hall. Please be sure to return the top portion of the bill with your payment. This graph shows your kilowatt/gallon usage history for the past 13 months. C.) What Have I Been Billed, What Do I Owe, and When Is It Due? Any unpaid prior balance, a detailed list of services billed, and appropriate taxes are provided. The previous and present meter readings, along with the KWH usage are also shown for your information. The total amount due upon receipt of this bill is shown as well. If this amount is not paid by the penalty date indicated, a penalty will be added and the gross amount will be due. If this information does not match your records, please contact the Utilities Department. Answers to other frequently asked questions can be found on the back of the bill.